This challenge is being hosted by Jessica at Quirky Bookworm. All you have to do to enter in my challenge is put your info in the GoogleDoc below (because it feels much more official if you're putting your name to it! ), and then read along with me. Every two months I'll have a little link-up/series of questions about the current book(s) for you to participate in. Below are the six classics that I've never read (the ones in bold - and yes, I'm totally embarrassed to be admitting this). The other titles I've read before, but it's been years. Re-reading participation is absolutely welcome, you just have to be willing to actually re-read the WHOLE thing, and participate in the link-ups. Scouts honor! 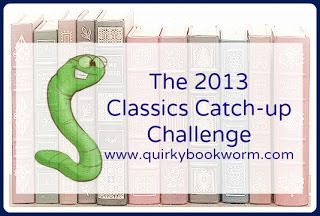 Yup, at the end of 2013, if you've read/participated for at least 9 out of the 13 classics, I'll automatically enter you in a drawing to win a $25 Amazon gift card! I am aiming for FRESHMAN LEVEL (0-4 classics).